don't get caught: Got too many cords, headsets & chargers? Raise your hand! Got too many cords, headsets & chargers? Raise your hand! 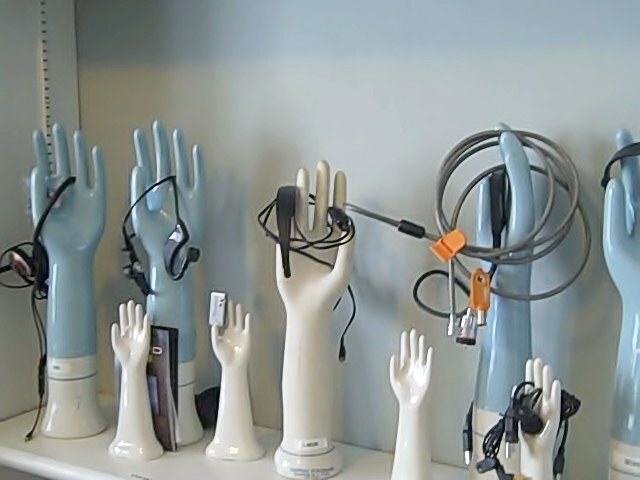 I've been reorganizing my office space and thought you might be amused by my solution for the seemingly endless parade of chargers, headsets and things with cords that go with all my devices: industrial ceramic rubber glove molds. I like that this arrangement lets me quickly scan and find what I need without having to rummage through drawers and boxes. The hand in the center got my thinking started--found in New Jersey years ago. I've been hunting antique stores for more, until I stumbled on a great source: The large blue and small white hands come from Fishs Eddy in New York City. If you're local, stop in, since the hands greet you on entering the store. Their shipping is fast and inexpensive; I ordered these on a short trip to New York last month, and they arrived at my house before I did. The best part? Now I smile when I see all my electronic leashes, instead of wincing.